I read a comment the other day which stuck with me for a bit. The commenter stated that there were too many people in the world and not enough land to house them all. Although I blame easy, cheap lending for the bubbles, people also have to be willing to pay such ridiculous prices. But if they believe in nonsense like this then this pretty much explains everything to me given that fiat money is unlimited. There are no limits to human stupidity. Certainly does a good job of showing how house prices are dictated by availability/cost of credit. As long as the banks will create 'money' (ie bank credit) for people who will use it to buy a house, the existing money supply means nothing. Also of course shows how mortgages are a massive money pump for the wider money supply in the economy at large. As long as the banks will create 'money' (ie bank credit) for people who will use it to buy a house and the government continues to force people to use that currency, the existing money supply means nothing. Getting corporate scofflaws like Apple to pay a commercial rent consistent with its geographic footprint and development use would act as a brake on runaway land prices. Ultimately, it's the job of the state to control these parasites and the damage they do to our cities and environment. As for this monstrosity. Whoever signed off its construction should be punched in the face every day for the rest of his life. Or do like Apple, you pretend that your building is worthless. Your brandnew HQ value $200. No problem I'll pay 2% tax a year on that value. Thanks guys! Some claims reflect extreme differences in estimated values. 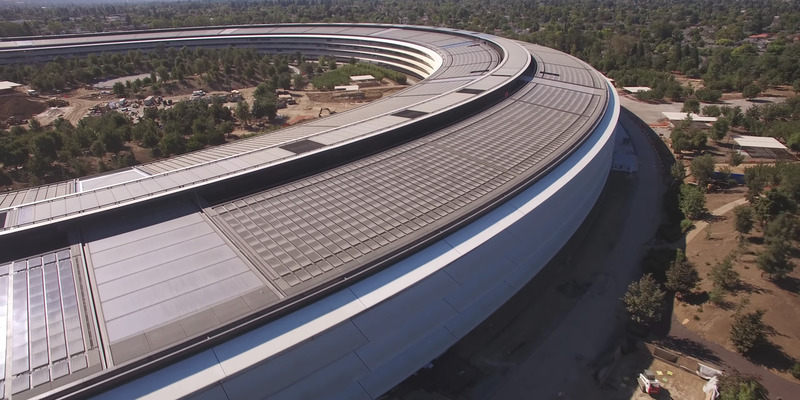 In one appeal filed in 2015, Apple said that a cluster of properties in and around Apple Park in Cupertino that the assessor valued at $1 billion was worth just $200. In another, property that the assessor valued at $384 million was, in Apple’s view, worth $200, according to an appeal application. No coercion is needed by the government - history shows that people will happily borrow as much as the banks will lend, when it comes to buying houses. The only restriction is whether or not they can meet the monthly payments and of course, ZIRP helps them to keep the monthlies low (at least for now). In the absence of that coercion, as the issuers of a currency overissue, which includes bad loans which will default, people lose faith in the currency and it loses value, and eventually they abandon it completely. It's like saying, as long as there is food, everyone will eat and get fat, then starve to death during Winter. This is obviously and demonstrably false. People did and do manage to restrain themselves, even in the face of total lack of requirement to save food for Winter. The propensity to self-restraint, by the by, is a genetically-influenced personality trait. The government's intervention the saving market is actually altering the population's genetics. Eugenics is apparently only bad when it is improving the population. When it is making everyone into Wall-E style degenerate blobs, it is A-ok.